Julien Labro (accordion); Jonathan Dixon (piano, organ, keys, rhodes); De’Sean Jones (tenor saxophone); Darrell “Red” Campbell (electric bass); Nate Winn (drums). 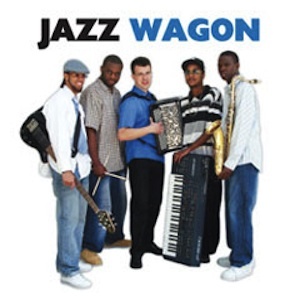 “Jazz Wagon” not only features some of the best young jazz musicians in the Detroit area, but the project also breaks new ground by integrating the accordion into the band’s aggressive style. The rhythm section is anchored by the dynamic drumming of Nate Winn and is highlighted by the remarkable musical talent of bassist, Darell “Red” Campbell Jr. Jonathan Dixon’s creative and melodic approach to the piano is the perfect compliment to the soulful direction of De’Sean Jones on tenor saxophone. The addition of world renowned accordionist, Julien Labro, adds an entirely new dimension to the project and provides the listener with a truly unique musical experience. Gaylord Klancnik (1945-2005), a lifelong accordion player and jazz enthusiast. Lawrence Williams (1938-2006), an unsung hero of modern jazz composition and amazing drummer.